Railpictures.ca - A.W.Mooney Photo: This is a once common scene that has almost vanished in this country. The street running. 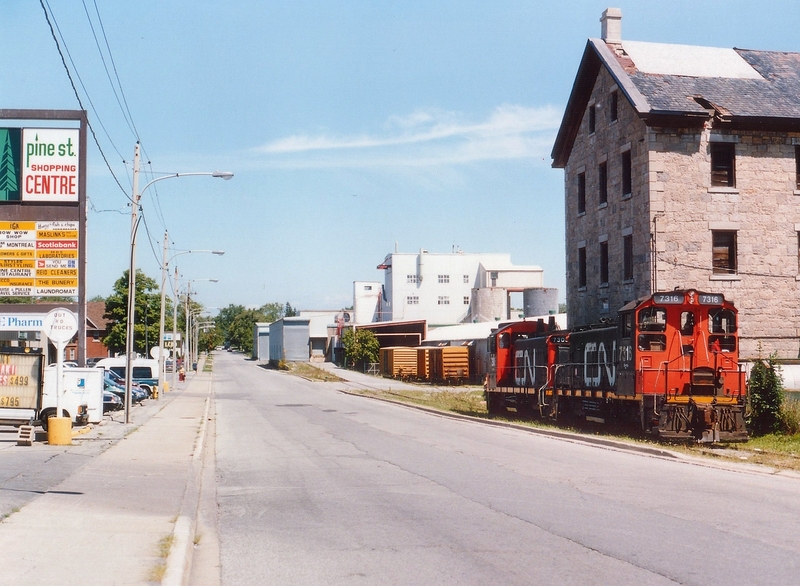 CN 7305 and 7316 have just run down the center of Pine St from the CN Canal Line and are seen following what was once NS&T trackage to the east side of the street to service the Gallagher Paper company, located just north of Albert St W.on Pine. Upon return the local took out 3 of the yellow boxcars as seen. Gallagher was served two days a week, but not long after Trillium took over this run from CN that year, Gallagher shut down and that was the end of the Pine Street Running. I do not recall Trillium actually servicing this plant. All track visible in this photo has been removed, the old stone building on the right has been restored, and the Pine St plaza has been updated. | Railpictures.ca – Canadian Railway Photography – photographie ferroviaire Canadienne. Caption: This is a once common scene that has almost vanished in this country. The street running. CN 7305 and 7316 have just run down the center of Pine St from the CN Canal Line and are seen following what was once NS&T trackage to the east side of the street to service the Gallagher Paper company, located just north of Albert St W.on Pine. Upon return the local took out 3 of the yellow boxcars as seen. Gallagher was served two days a week, but not long after Trillium took over this run from CN that year, Gallagher shut down and that was the end of the Pine Street Running. I do not recall Trillium actually servicing this plant. All track visible in this photo has been removed, the old stone building on the right has been restored, and the Pine St plaza has been updated. Love the old nose to nose SW1200RS’s.. Always a pleasure Mr Mooney. It looks as though this track is gone for good as the connection between Richmond and Hagar for the Pine St track has been pulled right out and nothing but a stack of old ties remains. Where the track was in the middle of Pine has been paved over, and it looks as though the rail was removed beforehand. My old stomping grounds, grew up two minutes from this spot. Thanks for posting this awesome shot Mr. Mooney! Some of my first memories I have was my mom taking us to the IGA and I would always be on the look out for trains coming down Pine St to service this industry. Great memories! We could still arrange a Pine St spur charter – the switch is intact..
#13 all time – this photo rocketed to the top. So Stephen….I guess you’ll be getting some street prop rentals for yourself..Eh? Street running always wins Look at #1 all-time. It’s untouchable and it’s another ‘Mooney’. But I bet a really nice street running scene could out-do it ! The types of photos in our top 10, 20, 30 or even 40 are very diverse and not dominated by any one type of photograph. Ultimately, a great scene and some kind of juxtoposition usually gets the stars, but street running usually rockets to the top quickly. I do not know myself, snake; but I am very appreciative of each and every one who awards a ‘star’ and of course knows how difficult this shot was to get. Those switchers usually operated under a ‘stealth’ mode. And I remind myself I used to go positively bonkers when I caught NS street-running down in Erie, PA !! Those “Lolipop” plaza driveway entrance signs are certainly a throwback to the 60′s. I miss those nose to nose 1200′s. Funny how CP ran theirs back to back. Great shot as always. It’s funny how the Pine St Spur is still intact after all this time… but the customer is gone – except for this segment which has been removed. Indeed it did. I’ve lived in Thorold all my life so it’s always awesome to see shots from here. Plus, it’s not everyday you see a shot from here. Paul Duncan has quite a few on NiagaraRails and I’ve seen a couple pop up on Facebook, but that’s it. A shot I always wanted but never a wheel turned when I was in the area 1997/98. ‘An industry you can model’. Beauty, Arnold. Thanks, Marcus. Wish I had been able to shoot more photos here, but you know, film, costs money…….Now I am wondering how popular digital was by 1999. You use it? Amazing photo as always Arnold! That stone building is now an apartment. This is an awesome shot. Miss when Thorold actually had action.